As a quaint and unique stadium, Ross Ade Stadium has been the home of the Purdue Boilermakers for since the mid 1920s. Before Ross Ade Stadium’s construction, the Purdue football team played at Stuart Field. During the first few decades of the 20th century, Purdue had a very successful football team. David Ross and George Ade, alumni of Purdue University, financially led the way in helping construct a new stadium for the football program in the early 1920s. The stadium was built on land purchased by Ross and Ade. The Purdue Boilermakers played their first game at Ross Ade Stadium on November 22, 1924 against the Indiana Hoosiers. The stadium originally seated 13,500 fans with seating on both the east and west sides of the playing field. 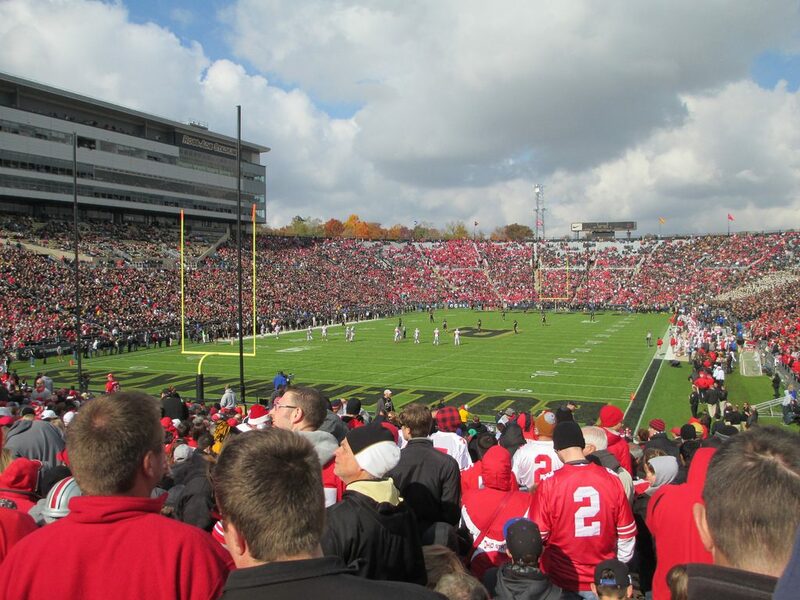 As more fans became interested in the football team, Purdue expanded Ross Ade Stadium. The first addition came in 1930 when 5,000 seats were added in the north end zone. A permanent grandstand on the west side was built prior to the 1949 season increasing the seating capacity to 51,295. One year later a new press box was built on the west side of the stadium. In 1955, permanent stands were built on the east side of Ross Ade Stadium boosting the capacity to 55,500. By 1963, the university lowered the field to add 13 additional rows of seats around the field. The last section of temporary seating was eliminated before the 1969 season when permanent stands were built in the north end zone increasing the seating capacity to 62,500. Since 1969, there have been few changes to Ross Ade Stadium. In 1997 a new video/scoreboard was installed on the south end zone and prior to the 2002 season a new press box on the west side was completed. This expansion also included 34 luxury suites and 200 club seats. Today a one tier grandstand in a horseshoe shape encloses the field. Additional bleachers are located at the south end zone where the main scoreboard is. Unlike many other stadiums in college football, Ross Ade Stadium has always had a natural grass field. In June 2014 Purdue announced it would remove 6,100 bleacher seats from the south endzone before the start of 2014 season. This area was be re-purposed and decrease the seating capacity of Ross Ade Stadium to 56,400. Before the start of the 2017 season lights were added to the stadium at a cost $6.5 million allowing the Boilermakers to play at night.